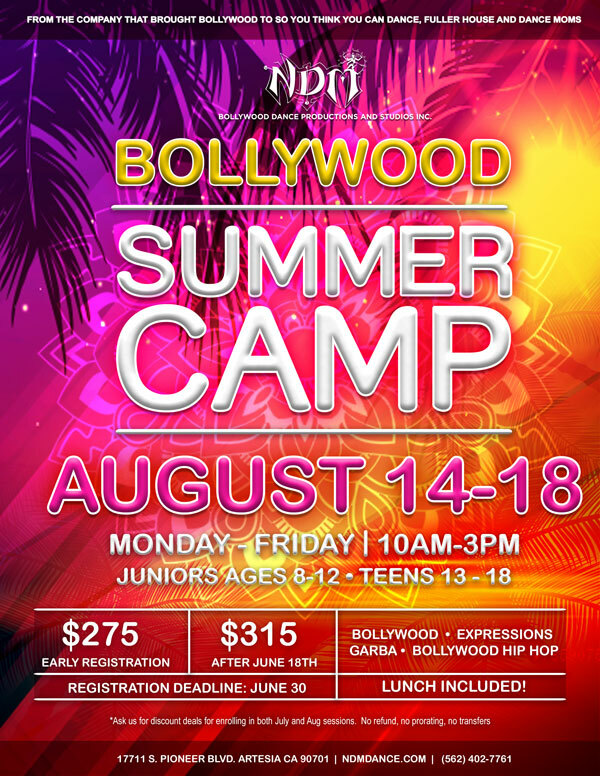 The Bollywood camp is a week long, Mon-Fri from 10am-3pm. The camp includes an hour for lunch (meal included). Bollywood: Bollywood dance technique. Learn a fun routine to a Bollywood song! Expressions: Learn how to be versatile with your facial expressions and tell a story through your face! Garba: Navratri season is right around the corner. Learn how to do Garba and Raas and impress your friends! Bollywood Hip Hop: Learn this new trend that has taken Bollywood by a storm. Fuse Bollywood moves with Hip Hop to learn a fresh BollyHop routine. Join us for lots of learning, lots of dancing and lots of fun! *Ask us for discount deals for enrolling in both July and Aug sessions. No refund, no prorating, no transfers.